In our latest published animation we compare our Automatic Two Speed Winch with a traditional one speed winch. The advantages are most significant. The Automatic Two Speed Winch automatically adapts speed to a change in resistance. This way, the rope is always tensioned, which makes the winching operation much safer. 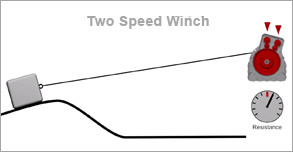 The Two Speed Winch also causes much less wear and tear. Visit our website regularly and take advantage of our informative visualizations and other current information about our products.